This name of this Kentish Town establishment, which dates from the late Victorian era, apparently has nought to do with politics. Rather it apparently takes its name from the fact that during the 18th century, this site served as a gathering – assembly – point for travellers heading further to the north – to places such as Hampstead Heath – in the belief that safety in numbers could protect them from highwaymen. There has been a public house on the site since at least the end 18th century (it’s suggested it was at one stage named the Bull), the current capacious, Grade II listed pub, was built in 1898 and, designed in the French chateau-style, features a corner turret. Inside there are still many original features including a circular glass dome, brilliant cut mirrors and elaborate wrought-iron screening. The pub can also apparently be seen in the 1971 Richard Burton film, The Villain. 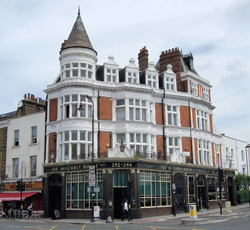 For more on the pub, which is located at 292-294 Kentish Town Road, see www.assemblyhouse.co.uk.